Global Teak Inc. delivers all teak applications on the interior or exterior of the boats. The most common application is exterior decking or interior flooring. We know that teak deck is the most important aesthetic feature in the total impression of the yacht. We will make every attempt to satisfy the decking customers by working to the exacting standards demanded by our prestigious customers. 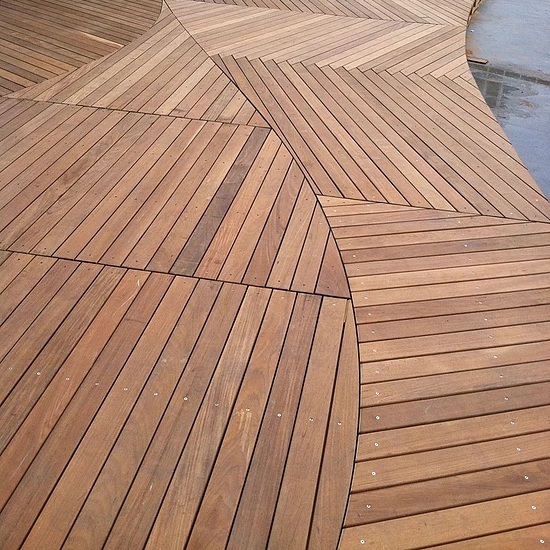 We help residential decking take offs including materials, designs and structures. We will send accurate quotes for custom designed decking drawings with recommendations of various species to suite your budgets. Some of the famous decking materials we offer are genuine teak, plantation teak, iroko and mahogany. We supply rails, posts, steps and stairs, vertical support posts and beams. All our decking is surfaced 4 sides (S4S) and eased two edges. It means we have taken guessing out of you for best surface. It also helps uniform looking and better control to meet exact customer requirements. However we can provide eased surface on four sides. Can be custom milled to accommodate hidden fastening systems. Available in "pre grooved" and T&G. Length range from 6'-20' (decking) , 3'-12' (siding or porch decking) and 3'-8' ( flooring). Other custom sizes also available. We can pull your order your specific length requirements. We also supplyTeak decking accessiories including sub structure/support structure parts on custom order basis. Please contact us for online quote here.